Located in Coxen Hole, Port of Roatan is one of the two major ports on the island. It can accommodate up to three cruise ships at one time. The Port of Roatan caters to ships from Norwegian, Royal Caribbean, and Celebrity Cruises. 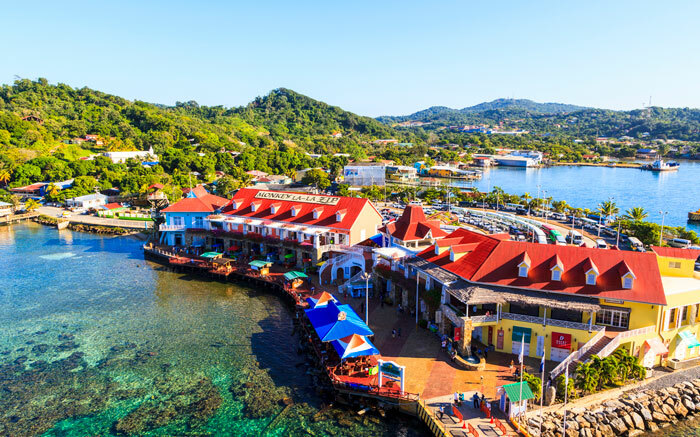 The Town Center at the Port of Roatan is where you will find everything from cute waterfront bars, gift shops, and jewelry and designer boutiques where you can purchase gifts to take back home. Should I stay in Port of Roatan while visiting Roatan? Although the port offers plenty of entertainment, the best option is to book a shore excursion in order to get familiar with the local culture and explore the island of Roatan. There are many great opportunities for adventure nearby and the drive from the Port of Roatan to the popular destinations on the island such as West Bay Beach and West End is approx 20 minutes and takes you past many popular island sites. Roatan is well-known for its beaches and some of them are the most beautiful in all of the Caribbean. West Bay Beach offers crystal clear blue waters with amazing white sand. West End is home to the popular Half Moon Bay Beach where you can rent paddle boards, snorkel gear, and beach chairs. Both beaches offer various food choices, as well as beverages and other refreshments. There is an abundance of excursions available from Port of Roatan. Whether you wish to go swimming, zip-lining, snorkelling, kayaking, scuba diving or fishing, the Port of Roatan offers easy access to all Roatan’s top activities. Learn more below on some of our most popular Port of Roatan Tours.